The Achitecture of Happiness is a dazzling and generously illustrated journey through the philosophy and psychology of architecture and the indelible connection between our identities and our locations.One of the great but often unmentioned causes of both happiness and misery is the quality of our environment: the kinds of walls, chairs, buildings, and streets that surround us. And yet a concern for architecture is too often described as frivolous, even self-indulgent. Alain de Botton starts from the idea that where we are heavily influences who we can be, and argues that it is architecture's task to stand as an eloquent reminder of our full potential. Alain de Botton is the author of three works of fiction and five of nonfiction, including How Proust Can Change Your Life, The Consolations of Philosophy, and The Art of Travel. He lives in London. "An elegant book. . . . Unusual . . . full of big ideas. . . . Seldom has there been a more sensitive marriage of words and images." 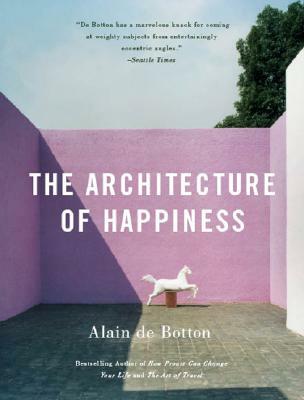 "With originality, verve, and wit, de Botton explains how we find reflections of our own values in the edifices we make. . . . Altogether satisfying." "De Botton is high falutin' but user friendly. . . . He keeps architecture on a human level."